Product #3165 | SKU HDSPERAYDAT | 0.0 (no ratings yet) Thanks for your rating! 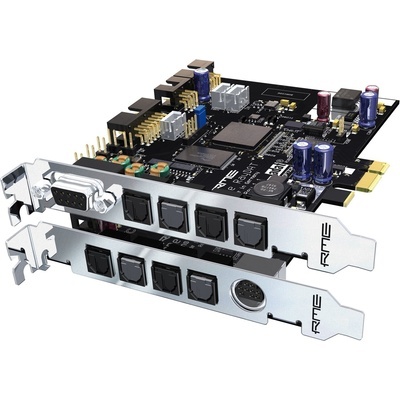 The HDSPe RayDAT from RME is a PCI express card system for Mac and Windows computers that's capable of handling 36 inputs and 36 outputs simultaneously. It provides 4 optical ADAT inputs and outputs, which support S/MUX technology making high-resolution 192 kHz recording and playback possible. It also features simultaneous operation of S/PDIF and AES/EBU ports, and two MIDI inputs and outputs on included breakout cables. There are two Express cards included with the HDSPe RayDAT, a main card and an expansion card. If you don't need the two additional ADAT inputs and outputs, or MIDI connectivity, then you can just use the main card. The system utilizes the latest plug-and-play technology to make installation as easy as possible, even for beginners. In situations where you need even more I/O, up to four sets of HDSPe RayDAT cards can be used at once. Up to 36 inputs and 36 outputs can be used simultaneously!